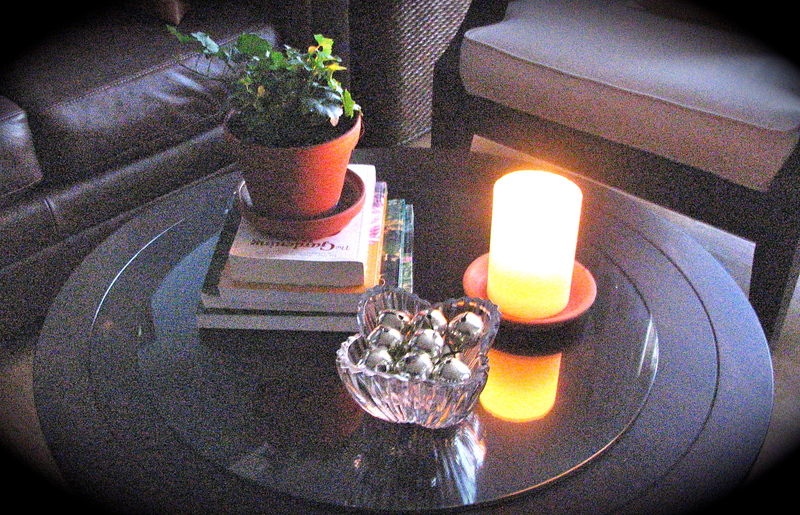 Two weekends ago after we put away our holiday decorations the coffee table in the living room was looking a bit puny— despite the fact that I keep a crystal bowl filled with jingle bells on this table all year round. [The jingle bells are from my childhood. Remind me sometime to tell you the story of how they came to mean so much to me.] Clearly the table needed something more on it, but I was all out of ideas. Then a few days ago while I was shopping at the grocery store I saw a small houseplant of ivy for sale. It looked very healthy so I bought it, brought it home and transplanted it into the first pot that I found in the garage. However, once I got the pot inside the house I realized that it was too small for this table and that it needed some height. So I pulled some gardening books from the adjacent bookshelves and placed the potted ivy on top of the books. Still I wanted something more on the table, so I took the plain vanilla candle that had been in the screened-in porch all summer/fall, brought it inside and put it on the table. Suddenly, I had a pretty look for the coffee table. Very coordinated & cheerful. Or so I thought at first…. It wasn’t until the next day when I lighted the candle and sat down in the living room to read a book that it dawned on me that I’d set up a tableau that amounted to the Roman Catholic Church’s time-honored excommunication ceremony. Finding out that I couldn’t excommunicate myself while decorating a coffee table has set my mind to rest about this situation. Also, considering that I’m not Catholic I figure that the authorities won’t want to waste holy water on me either. So, tell me about the jingle bells… There also must be some story for how you happened to know that you set the stage for an excommunication ritual. Still, it’s good that you can’t accidentally excommunicate yourself from a religion to which you don’t belong. =) I love the story! Zazzy, I knew about this excommunication ritual because of the movie titled: Bell, Book and Candle. Plus as an English major we learned all about RC in the course of reading English Lit. I’m so impressed, but not surprised that you remembered all of this from your studies! I’m so ashamed of myself when I can’t answer all the art history questions on Jepardy! The set up on your table is beautiful, and very balalnced. I would never associate it with an excommunication ritual. And I agree with everyone else….I’d love to hear the jingle bell story please! Beth, for some reason all that “how-to excommunicate someone” info stuck in my brain. Maybe it was on a test! Thanks for the compliment about the coffee table. I try to decorate with a bit of flair– and using all the principles I learned while creating retail displays years ago! Oh boy do I remember those bells! This sure sounds like a hint of your Dad speakng. Becky, you were part of that jingle bell scam, so don’t try to pawn all of this off on my Dad!! And if I start talking about the bells, who’s to say I won’t start babbling about the whole duck nightmare situation. Huh? Sounds like some good stories here! Is the ivy part of the excommunication too? 🙂 Looks great to me. Margaret, the ivy isn’t part of the ceremony. Perhaps it is that piece of the coffee table tableau that keeps me safe from a true excommunication! Or the fact that I’m not RC. Kristen, “the whole meaning is quite unfortunate” is a good summation of what I did. I’m an active amateur when it comes to interior design, so every time I succeed in doing something good I’m pleased with myself. Regardless of what it might mean! WOW. That is absolutely hilarious!!! You’re a much better informed person than I…Thanks for the laugh! Melisa, glad that you enjoyed it– goofy story that it is. I want to hear the other stories! It looks good! Sue, thanks. In time I’ll get around to the story. Funny post. It would have never crossed my mind! c, I’m still rather amazed that I even thought of it. My mind works in some unusual, but harmless, ways!